We've been working hard to get things ready fro the extension here on the homestead. We've been putting in soak aways for drainage, digging footings for the patio and adding land drains to the field by the house which is always wet. We've got an incredible amount done. I'll do a proper post on it all later in the week, at the moment I'm very stiff and sore and ache all over, as only four days on a shovel can so to you. That stinks. Look forward to the upcoming post. I guess some work with a comealong will be needed in order to get that track back where it belongs. Arrgh! 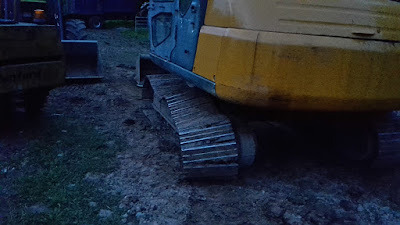 According to what our neighbor who has a heavy equipment business tells us, getting a track back on a big piece of machinery like that is one heckuva job. Hope it goes well for you. Get it all done while you are young, Kev. When you get older it's ten times harder. What's Your Best (or Worst) Bread Making Mistake? My Eldest Checking The Sheep!